Are you hunting for the best portable generator to provide you with sustainable, reliable power anywhere and anytime? Have you scoured the internet to find the best products available, but aren’t quite sure which ones are really worth the hype and which fail to live up to expectations? We’ve put together the following comprehensive guide to the top portable generators on the market currently. From key product specs to our unbiased review to pros and cons you need to consider, we’ve got you covered. The DuroMax 4,400-watt portable generator is a powerhouse of gas energy. Its power levels make it an ideal choice to fuel both recreational and household needs, as it can support everything from high power appliances to recreational vehicles. The DuroMax XP4400E generator features an impressive 3500 watts of continuous power with a 4400 beginning wattage. The gas tank has a 4-gallon capacity with 8 full hours of run time, plus an electric key start with battery included. It runs on 10/30 SAE motor oil. The DuroMax generator is also incredibly user-friendly, with helpful control meters and buttons on the side of the product for easy access. You’ll have a range of outlet options, since the DuroMax XP4400 lets you switch between 120 and 240 voltage as you require. It also features multiple outlets with 20 amp, two 120-volt, and 120/240-volt 30-amp capabilities. Its power makes it effective for a wide range of uses. Bear in mind, the generator’s engine is a bit louder than other products available currently, but if power is more your concern, this shouldn’t be an issue. It’s 120 lb. weight makes it somewhat difficult to maneuver, but it’s handle and wheels help take the load off. All in all, the DuroMax XP4400E is an impressive source of gas generated power to fuel your household or recreational endeavors all day long. The 3800-Watt Dual Fuel generator by Champion is a force to be reckoned with, with a 224cc engine that can run on either propane or gas. Check out the specs and our review below. The Champion 3800-Watt Dual Fuel RV Ready Portable Generator is perfect to give you extra power at home or on the road. 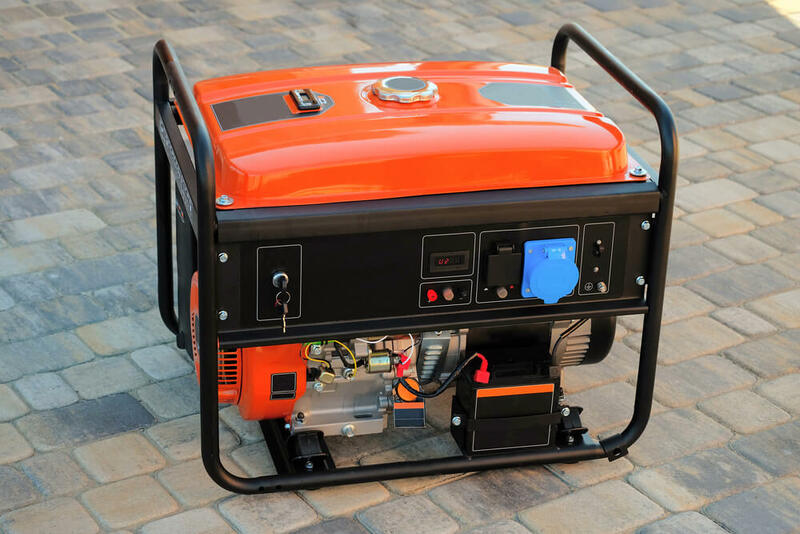 You can run the generator on either propane or gas as you prefer, making it easy to alternate between both sources of fuel without risking hazard. When run on gasoline, the portable generator’s 224cc engine has a 4750 starting wattage and 3800 running wattage. The 3800-Watt Dual Fuel Generator has the capacity to run for a full 9 hours with a 50% output if the 3.4 gallon tank is sufficiently fueled.The portable generator has a rather loud 68 dBA noise level, similar to the hum of a vacuum. The generator also features an Intelligauge system, letting you keep an eye on run-time hours, hertz, and voltage. The generator comes with a wheel kit, engine oil, oil funnel, propane hose, and battery. Overall, the Champion 3800-Watt Dual Fuel generator certainly lives up to its name, with a long battery life, flexible fueling options, and extensive outlet options. 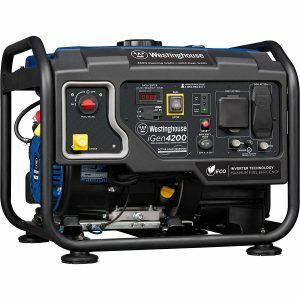 The Westinghouse WGen 7500 portable generator is easy to use and highly durable, with an astounding 9000 watts of starting power and 7500 watts of continuous power. With a remote start, recoil and electric start options, and as long as 16 hours of running time with a full fuel tank, the WGen 7500 stands in a class of its own. Check out the specs and our review below. The WGEN 7500 generator is a wonder of gas-powered energy with 9000 starting watts and 7500 watts of ongoing power. The generator itself is encased in a sturdy steel frame featuring roll bars resistant to wear and tear. It also sports a cast iron sleeve to protect the generator and make it easier to transport from one location to the next. Because the fuel tank is so large, you can run the generator for 10 hours or more if you keep it at a 50% load, which is especially helpful if you’re trying to power large appliances. The portable generator is also very fuel efficient, so you can switch it on at low temperatures. We also appreciated that the product has an automatic low oil shutdown feature which will switch the generator off in case of overheating or low fuel levels. One downside is its bulky 200-pound weight, making the generator difficult to move from one place to the next. 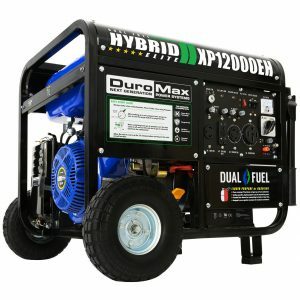 The DuroMax Hybrid Dual Fuel XP12000EH is truly a beast of a generator, with 12,000 watts of starting power and 9,500 watts of ongoing capacity. No matter what your electrical power needs are, this portable generator will do the trick. Whether you need to power your house in the case of an outage or keep large tools running at full battery on a worksite, the 457 cc, 18 horse power engine of the DuroMax XP12000EH could be your new best friend. It sports steel bearings and cast iron cylinder sleeves, with 4-point rubber mountings to keep the generator running like a dream. We really liked how the DuroMax XP12000EH has a primary overload circuit breaker as well as separate circuit breakers to protect the generator from heating up or becoming damaged from circuit overload. While the generator is pretty bulky to maneuver, it does come equipped with a transportation kit, including handles and rubber wheels for steering. The Wen 56475 4750-Watt best portable generator is a CARB and EPA compliant product that features a handy digital readout to monitor oil changes and maintenance, plus a 223cc engine for an excellent surge wattage of 4750. The WEN 56475 4750-Watt Gasoline Powered Portable Generator is perfect for both large power and more sensitive devices, whether you need to power up your home in the event of an outage, your family’s laptops, or keep your RV running during your next camping trip. The portable generator is also an ideal fit for powering large tools at worksites. We liked that it is EPA and CARB compliant, making it a viable choice for users across all 50 states. The tank capacity is lower than other products on the market at 4 gallons, but you will be able to keep the generator running for up to 10 hours at half output. If you go camping a lot, the WEN 4750 is an excellent choice to ensure all your appliances are fueled without hazard, as the generator sports a spark arrestor and automatic voltage regulator. While we would have preferred a longer warranty, the 2-year warranty WEN offers is certainly a step up from the standard 1-year offering. Another exceptional portable generator option by Wen, the PowerPro 56101 has a 2 stroke, 2hp engine with 900 watts of ongoing energy output and 1000 surge wattage. It is also a CARB compliant product. Let’s delve into the product’s specs and our ultimate verdict. The PowerPro 56101 delivers sufficient wattage with 900 output during continuous use and 1000 start up wattage. The generator’s wattage capabilities are lower than other products currently on the market, but if you don’t really need to run large appliances or high-power tools, that probably won’t be an issue for you. It features two kinds of outlets, including one 5-20R 120V receptacle for an ongoing 7.5 amp output and 8.3 amp surge. You can use this outlet for a wide range of power tools and devices. The second type of outlet is a 12V that lets you charge at 8.3 amps with a 100-watt charge. You’ll need to use a 32:1 gasoline/oil ratio to fuel the PowerPro 56101. The 1-gallon fuel tank will run for 5 hours at a half-load. Again, this might pose an issue if you need to charge really powerful tools for long periods. Additionally, the portable generator does not include a fuel gauge so you will need to physically monitor the amount of time you run it to ensure the gas/oil levels don’t drop too low. The next best portable generator is by Westinghouse, featuring an impressive 4200 peak wattage and 3500 continuous wattage for running high power tools and devices. It also sports an open frame inverter with Hybrid technology to keep things fuel efficient and ensure the durability of the product. The Westinghouse iGen 4200 certainly has a lot going for it, with 3500 rated watt power and 4200 peak watts. The gas-powered generator uses special Hybrid technology to keep your tools, appliances, and devices running while ensuring fuel efficiency at the same time. It also sports a 5-20R 120V duplex outlet for home use and a TT-30 30-amp outlet for RVs. What’s more, it features two separate USB outlets, making it an excellent pick for anyone who goes camping a lot or wants a generator in the event of a power outage. Its 212cc 4-stroke engine makes for an astounding 18 hour run time if you keep the generator on a low volume output. The engine is pretty quiet too, with a 62-dBA noise level and a special efficiency mode to help you make the most out of your fuel. We really like that the Westinghouse iGen is safe for powerful tools, recreational vehicles, home use, and even sensitive electronics like TVs, computers, and phones. Unfortunately, it only comes with a 1-year commercial warranty, but the 3-year residential warranty is exceptional. The next generator on our list certainly lives up to its name, with 12,000 starting watts and 9,000 running watts. The A-iPower SUA12000E runs on a powerful 459cc engine and can go for up to 9 hours at a half load. Let’s take a closer look at the specs this product has to offer. One of the lesser known portable generators on the market, this product by A-iPower is worth taking notice of. You will have tons of flexible outlet usage with this device, as it includes four 120VAC 20A nema outlets, one 120/240VAC 50A nema outlet, one 120/240VAC 30A nema outlet, and one 12VDC 8.3A adapter plug. It offers 9,000 watts of continuous power, with a substantial 12,000 watts of starting power. If you don’t mind a noisier generator and are more focused on running high power tools, that shouldn’t be a problem. The engine’s air-cooling feature does help muffle some of the noise too. The choice on our list is highly portable, making it a great option if you’re on the go and need an excellent power source with you. 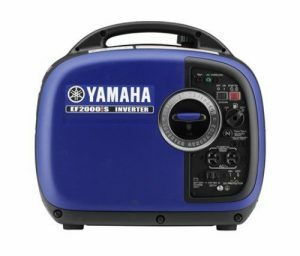 The Yamaha EF2000iSv2 looks similar to a boombox or radio, and is very easy to start and use with highly sensitive electronics. While the Yamaha EF2000iSv2 is very lightweight, it is also extremely durable with excellent longevity of use. The engine is very quiet as well, so you won’t be annoyed by loud noises distracting you if you’re trying to get some sleep while camping. When running at a quarter load, the generator maintains 51.5 decibels, which is far lower than many other products on the market today. The generator offers 2,000 starting watts and 1,600 continuous wattage, which is quite a bit lower than other products available, but not surprising considering how small the product is. If you run the generator at a 500-watt load, you can still get an impressive 8 hours of running time. Not bad! What’s more, if you decide to run the generator at a quarter load, you’ll have 10 full hours of power for all your devices. Unlike other generators, this particular product does not come with oil, so you will need to purchase your own before using it. The Generac 7117 generator is a good choice for both higher power tools and appliances as well as sensitive electronics, so you’ll get the most out of your pick. It weighs just 46.6 pounds, so it is easy to maneuver and far less bulky than other products currently on the market. The Generac 7117 is not only incredibly lightweight and easy to use, but offers 1700 watts of running power and a surge power of 2200 watts. While some products on the market may have higher running and surge rates, if you’re looking for a product that is simple to transport while working with sensitive devices, this could be an excellent choice for you. The 1.2-gallon tank will keep the Generac 7117 powered for up to 7 hours at a 50% load and 10 to 12 hours for daily operation on a single gas tank. 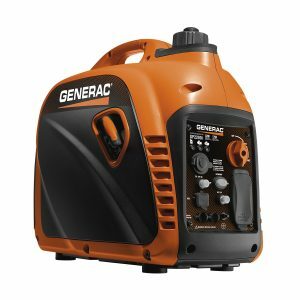 So, if you don’t need to power heavy tools all day long with your generator, you’ll still get plenty of use and power out of this product. The generator features a helpful eco-mode so you can monitor how much fuel you’re using at any given time. The low oil shutoff also makes it easy to avoid overheating. Unlike some generators, this product features just a recoil starter, which is not unusual with smaller models. You can switch the generator on easily and operate it with a user-friendly control panel though. The panel features plastic covers to guard the electrical outlets, plus you’ll have plenty of outlet options to pick from. Our final pick is this exceptional offering by Briggs & Stratton, providing 25% additional wattage to let you power up large tools and appliances all at once. The mighty 420cc engine and 7.5-gallon fuel tank makes this a great choice for charging high power devices all day long. The power output from the Briggs & Stratton 30664 is one of the best in its class, with a normal wattage of 8,000 and surge wattage of 10,000. High levels like this product has makes it easy to power your home, RV, or tools at a job site if necessary. We really appreciate how user-friendly and comprehensive the cable ports are for the Briggs & Stratton 30664. The control panel has multiple outlets for flexible use, with outlet protection to guard you from shock in case of damp weather conditions. There is an AC output for 120V and 240V, along with two 3 Prong NEMA duplex outlets. The 30664 runs on unleaded gasoline, with an impressive 7-gallon fuel tank capacity. 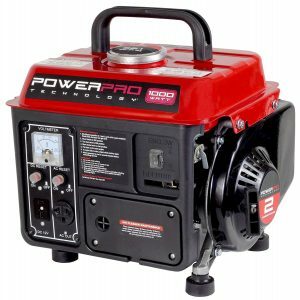 As a result of its extensive output, this portable generator is more of a gas guzzler than other products on the market. The generator engine is also much louder than some of its competitors. However, you can keep your generator running anywhere from 8 to 9 hours at 50% output if your tank is full. To help you make the best choice when purchasing your portable generator, we’ve put together a comprehensive buyer’s guide with the key elements you’ll need to consider before making a selection. There are several pre-purchase considerations to bear in mind if you are in the market for a portable generator. First, you need to determine how much power you require. For instance, your fridge may require 700 watts to run but as much as 2100 watts to start up. Identify your purpose for making the purchase, and determine the wattage you need accordingly. You also need to find out the kind of outlets you require. For example, smaller generators typically have a few 120V AC outlets plus USB ports, while larger devices of 4,000 watts often have 240V plugs too. If you want to hire an electrician to wire the generator to your panel, you’ll need to purchase a generator with a 240V plug. You’ll need to consider how often you intend to use the generator. If you only intend to use a generator in the event of an emergency, a shorter warranty time would suffice. On the other hand, if you intend to use the generator daily for work, a longer warranty is your best pick. Consider the size of the fuel tank before purchasing the best portable generator to meet your needs. The larger the fuel tank is, the more time you can go without having to add more fuel. You should also decide whether you’d prefer a recoil cord you can pull or if you like an electric start instead. Noise level is another factor to consider. If you’re going to be in an area where a quiet engine is essential (like a campsite), noise level is going to matter. However, if you plan on purchasing your generator to power large tools at a loud construction site, this probably won’t be an issue. There are three main types of generators. The type discussed in this guide is a portable generator. Portable generators run on diesel or gas fuel and offer temporary power for users. The second type of generator is an inverter generator. Inverter generators run on an engine linked to an alternator for AC power. They also feature a rectifier to transition AC power to DC power. The third type of generator is a standby generator. A standby generator is electrically powered by an automatic transfer switch that turns on the device during a power outage. The first benefit of portable generators is clear—they are very portable! You can bring them with you from one place to the next with ease, whether that be your house, a campsite, RV, worksite, or otherwise. What’s more, portable generators will help you save big if you live in an area that experiences a lot of storms. The generator will keep your appliances running if an unexpected outage occurs and help you avoid your devices dying or food spoiling. Portable generators are also fantastic power sources for gardens or sheds, so you can really use them for any electrical needs you have. Another benefit of portable generators is that they are easy to use. Not only are they extremely mobile, but they are designed for simple user operation. Many portable generators feature circuit breaker protection and guards, so they are safe and secure for anyone to maneuver and operate. Whether or not a generator will damage your electronics depends on the quality and voltage of the device. Some generators are best used for large power tools and appliances only, while others work with a range of devices, including sensitive ones. If you want to use your generator to power electronics, choose a product that is compatible with sensitive appliances, with features like inverters and automatic voltage regulators. For short term storage, simply put your portable generator in a safe place where you have easy access and it won’t gather dust or debris. For long term storage, first check the maintenance manual to see what the manufacturer instructs. Always remember to fill the fuel tank high before storing for long periods and treat it with a stabilizer. It is not safe nor recommended to use a portable generator in the rain. Not only could you run the risk of electrical shock, but the rain could damage your device. If you have to use it in damp environments, protect it with a canopy or tent. Yes, a portable generator with sufficient wattage can keep your house running in event of an outage. You can link the generator right to the circuit breaker panel in your home to control appliances directly. However, you’ll need to have an electrician install a transfer switch in your breaker box if that is your main goal for your generator. 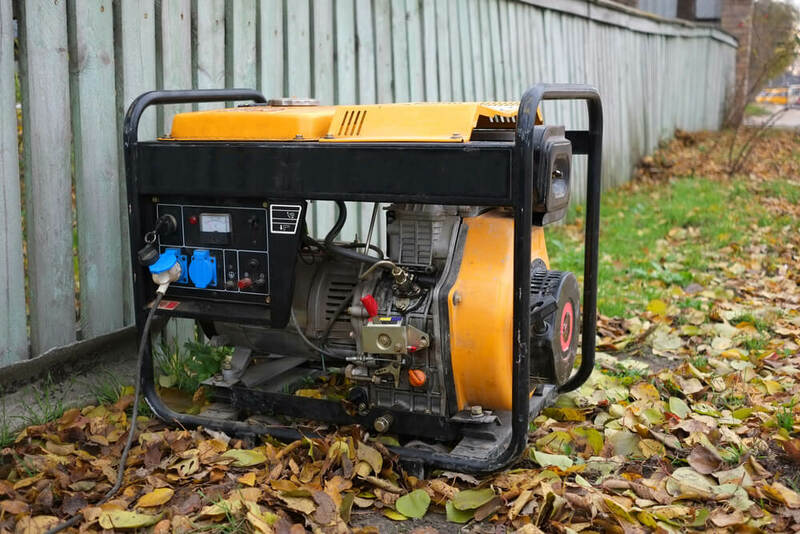 Portable generators can last anywhere from several years to decades with proper maintenance. Most generators have a 10,000 to 25,000-hour shelf life. Choosing the best portable generator to meet your needs is a process requiring time and consideration. Determine what your purpose will be for the generator, how often you intend to use it, and the types of devices you intend to power with your portable generator. If you want to keep your entire home powered in the event of an outage or run large power tools, choices like the DUROMax XP4400E, Westinghouse WGen 7500, DuroMax Hybrid and Dual Fuel XP12000EH are fantastic options. For lower power needs, picks like the Yamaha EF2000iSv2 or Generac 7117 are excellent. Each product listed is among the best in its class for quality specs, features, power capabilities, and running time.